The Wild Thornberrys Movie is a fantastic animated, Nickelodeon flick. Nigel and Marianne Thornberry make wildlife documentaries. They travel throughout Africa filming the wild and wacky ways of all sorts of animals. Eliza Thornberry, their youngest daughter, is a young girl with an extraordinary gift, she can talk to animals! Two years earlier, she rescued a warthog who turned out to be the powerful Shaman Mnyambo. He granted her the power to hear and speak to all animals. Eliza's grandmother comes to visit and decides that Eliza needs to behave more like a lady so she takes her back to England to attend a prestigious boarding school. However Eliza has different ideas and so begins her exciting adventure to stop evil poachers and save her animal friends. This is a great, fun and action packed movie. The characters all play their own important parts in the story. Aswell as the loveable Eliza and her parents, there is Eliza's best friend Darwin, an over dramatic monkey, her no brains/big heart sister, Deborah, her 'animal boy' brother Donnie and villains Sloan and Bree Blackburn. This movie is full of action and adventure and I recommend it to everyone. If you have ever seen Rugrats, and liked it, then watch The Wild Thornberrys. You'll laugh and cry as Eliza and the gang embark on their exciting journey. 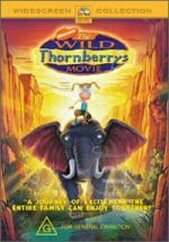 With a great cast of characters and a funny, enjoyable storyline, I give The Wild Thornberry Movie two thumbs up! This flick is shown in widescreen format. 5.1 Dolby Digital - The film features the voices of actors Tim Curry, Rupert Everett, Marisa Tomei, Lacey Chabert and Lynn Redgrave and has a really catchy soundtrack. I found playing it through surround sound was really effective. The extras on this disc are not fantastic but there is really no need for extensive explanations with this kind of animation. The extra features are, the theatrical trailer for the film and a music video for the theme song, 'Father and Daughter', sung by Paul Simon. The animations are fantastic and it is shown in widescreen format.